The Papanui-Innes Community Board is contesting the reduced amount it is receiving in Christchurch City Council funding to allocate for spending in the community. And they have written to the mayor about the reduction to voice their concerns. 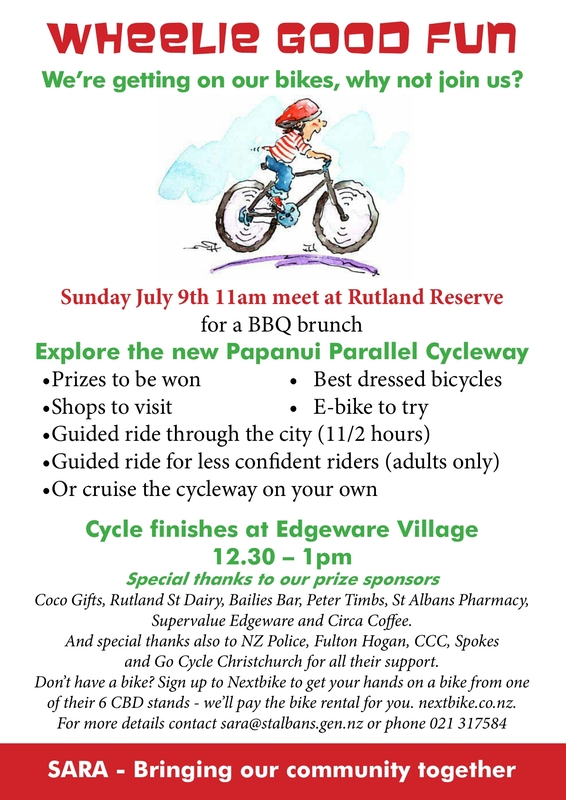 SARA’s AGM on September 10 will feature Robert Fleming, a member of SPOKES who will talk about cycleways (Papanui Parallel in particular), recreational cycling v cycling for transport and the work that SPOKES does to promote cycling. AGM starts at 10am at the St Albans Community Centre, 1047 Colombo St. All welcome especially those willing to lend a hand making St Albans the best place in Christchurch to live. Young people could be the deciding factor in the 2017 election, if they bother to vote. That’s the intro to the Special Election Issue. Find out who have signalled plans to stand as candidates in the Christchurch Central electorate or in Te Tai Tonga, the Maori electorate that pretty much covers the South Island and a batch of smaller islands. Which party should we vote for? We won’t be telling you who to vote for but read contributions penned by old political hands and those aspiring to knock them off their perches. You can also follow some of the links to party websites and try out tools designed to help match your values with those espoused by the parties. And there’s a tiny bit of room left for some non-political news at the end. Click on the image to download. Edgeware is getting a new cafe and bakery. 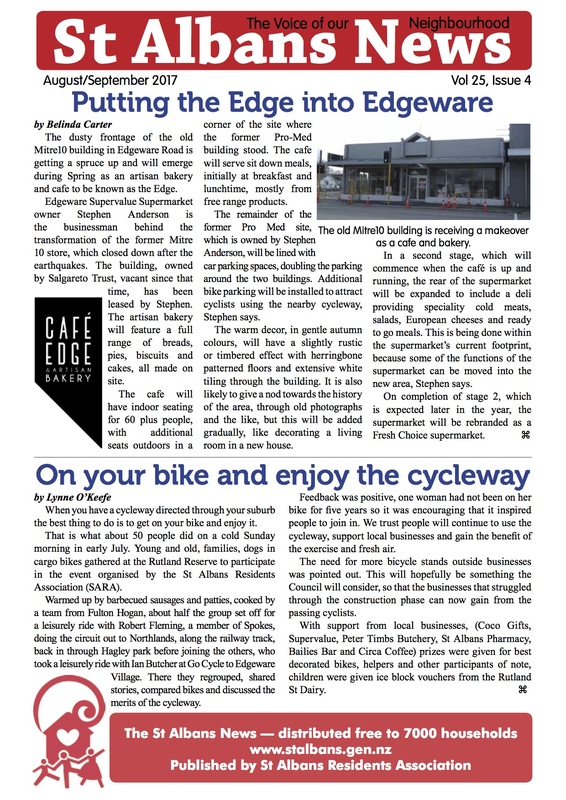 It’s called the Edge and you can find it in the old Mitre 10 building sometime in Spring, right next to the Supervalue supermarket. The new cycleway may not be finished but it has been officially launched. Find out more about an old school in Springfield Rd that no longer exists but was built as a WWI war memorial and read Daph Parkin’s memories of St Albans School in the 30s and 40s. 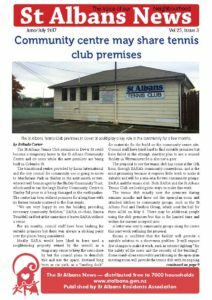 Find out more in the August/September 2017 edition of St Albans News. Click on the image to download. 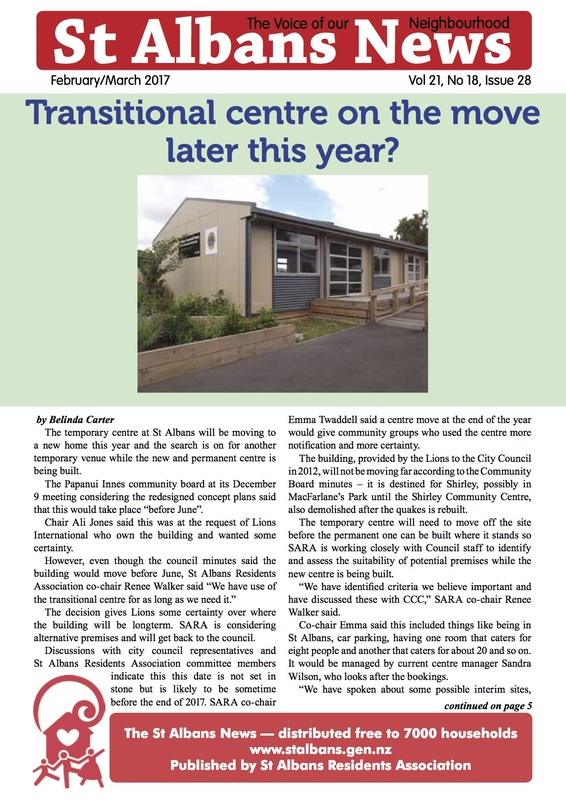 The transitional community centre is soon to transition to a park in Shirley but what will happen to community groups using the community centre in the meantime while the new centre is being built. The residents association (SARA) and the tennis club in Dover St have come up with a possible solution that is a win-win for both groups. If you have regrets about that tattoo you got when you were a teenager and want it removed you might be interested to know there is a place in Springfield Rd that will help you do just that. 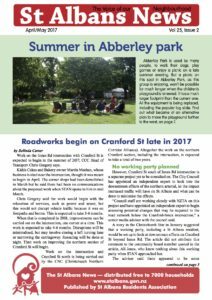 Find out more in the June/July edition of St Albans News. Click on the image to download. Want to know what issues concern St Albans: the cycleway, what is happening downstream from the northern arterial (i.e. : Cranford St and Sherborne St), the community centre rebuild, and Abberley Park to name but four. These are ongoing stories. 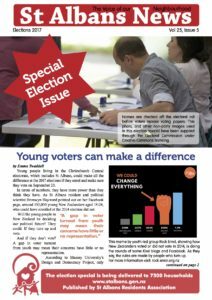 But you’ll also hear about what is happening in schools and preschools, in our streets and parks in the April/May edition of St Albans News. Click on the image to download. The Packe St Park and Community Garden will be doing a bit of strategic planning at the AGM, so if you are interested in the future of the 21 year old community garden, attend the meeting which is being held at the St Albans Community Centre, 1047 Colombo St on Sunday, March 12 starting at 5.30pm. Supper provided. Parking is a bit tricky on Colombo St with the cycleway being installed but the centre has a car park accessible from Caledonian Rd and of course there is plenty of parking in that street as well. The Friends of Abberley Park group has been set up to make sure St Albans residents and other users of the park’s interests are taken into account in any planning moves and changes by the park’s owner, the Christchurch City Council. The Friends’ next meeting is at Abberley Park Hall on March 30 at 6pm. It looks like the transitional community centre will be heading to Shirley later this year when work begins on the permanent centre. But what will happen while the centre is being built? We find out that nothing is certain yet, the date this is happening has not been decided and where activities that happen in the centre will go in the interim is still being discussed behind the scenes. Have you thought about buying an electric bicycle to get around town – we talk to two St Albans residents who say it has changed their lives. All this and plenty more in the December/January issue of St Albans News. Click on the image to download. The Labour Candidate for Christchurch Central, Dr Duncan Webb has discovered that Southern Response owes homeowners thousands in wrongly withheld refunds.